BuzzFeed designer Mark Davis has made a freely available font version of US presidential candidate Donald Trump's handwriting, and used it to annotate a Dezeen article. The Tiny Hand typeface recreates Trump's distinctive handwritten style, from the strangely angular Js to the dramatically curved Bs, Ds and Gs. Davis has designed several different versions of each letter, to recreate the haphazard nature of Trump's scrawl, including a particularly unusual spiky B. "Donald writes in a distinctive way – he holds his pen so the edge is 90°, where most people hold theirs at 45°," said Davis. "Hs letters are remarkably wide, but even more interesting is that the tops and bottoms of his letters are the heaviest parts." "When I tried to create characters for the font that I couldn't find in samples he wrote, I busted out a sharpie and tried to 'be Trump'." The design was originally created for a satirical piece published by BuzzFeed, which purported to be pre-debate speech notes written by the candidate. Trump is known for covering printouts of articles about himself in handwritten notes, often with derogatory comments about journalists, or the statements made. A 2011 Vanity Fair blog prompted additions such as "Oh really!" and "Not allowed". Ben King, BuzzFeed News' deputy editor, uncovered Trump's penchant for handwritten commentary while researching visual cues to accompany the piece. "The search yielded several examples of Trump's... eccentric handwriting style," he said. "With only a cursory search – and more focused keywords – I was able to find other examples of his handwriting." "Trump's notes, written to friends and enemies alike, were almost always written at an angle, scrawled on top of printouts of articles from the internet... I was struck both by the peculiar delivery of the notes, but also by the idiosyncratic way Trump writes the alphabet." Referring back to these images, BuzzFeed commissioned graphic designer Mark Davis, who previously worked at Font Bureau, to transform them into a complete typeface. 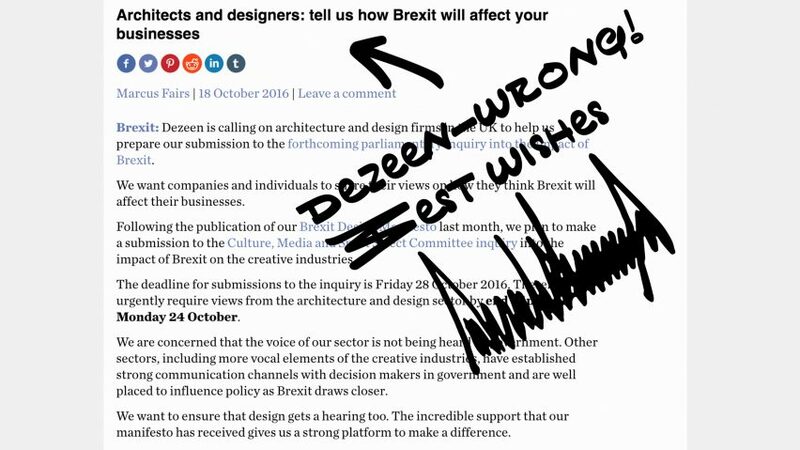 Davis has also used Tiny Hand to mock-up Dezeen's own version of Trump's handwritten comments, which reads: "Dezeen – wrong! ", and includes a signature which is also part of the font. Tiny Hand is available for free download. Ahead of this year's US election, which takes place 8 November 2016, a host of designers have unveiled politically charged projects. A Mexican architecture studio envisioned the wall that Trump has proposed to build along the US-Mexico border as a giant pink barrier, while a group of designers created posters encouraging Americans to head to the ballot stations.